LOUISVILLE Much like Babe Ruth himself, reportedly calling his shot in the 1932 World Series, Baptist Sports Medicine is swinging for the fences, behind a powerhouse team of experienced physicians and staff, a tradition of orthopedic care, and an integrated new facility at Baptist Eastpoint. The sports medicine program is a natural springboard off the existing foundation of Baptist Health’s services. Baptist Hospital East has long been a leader in orthopedic care in Louisville with the highest volume of total joint replacement procedures in Kentucky and a rank of eighth nationally. Baptist Hospital Northeast has been providing athletic training services to Oldham County schools for 12 years, and Baptist Eastpoint, the system’s newest outpatient center located off Old Henry Road in Louisville’s east end, already housed an Urgent Care center and physical therapy outreach clinic for the system. Leading the sports medicine charge is board-certified orthopedic surgeon and Medical Director of Baptist Sports Medicine, J. Steve Smith, MD, who realized “Baptist had everything they needed to have a sports medicine department, but it just wasn’t organized into a cohesive unit.” John Wortley, executive director of Baptist Health Community Services and the administrator overseeing the project, says, “A sports medicine center in Louisville is something we have considered a couple of times over the past 10 years.” He attributes its coming to fruition now to the right staff at the right time. A native of Lawrenceburg, Kentucky, Smith played college baseball at Western Kentucky University and attended the UK College of Medicine. 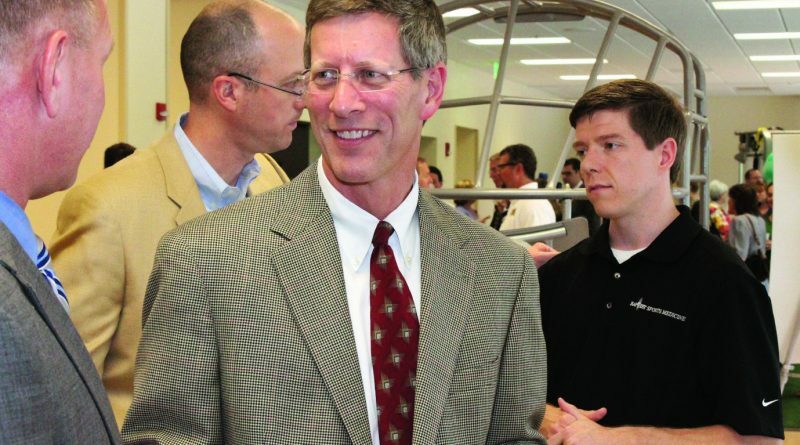 He pursued an orthopedic sports medicine fellowship at the Kerlan-Jobe Orthopaedic Clinic in Los Angeles, California, and served on the medical staff of the LA Lakers, LA Dodgers, USC football team, and other teams before returning to the Bluegrass. The foundation for Baptist Sports Medicine began at Baptist Hospital Northeast, which provides full-time athletic trainers to four local high schools – Oldham County, South Oldham, North Oldham, and Henry County. In addition to Oldham County, they also consult in Trimble County and work with Hardin Memorial Hospital through their management contract. The new program in Louisville has already signed the Kentucky Stickhorses professional lacrosse team as a client and plans to work with numerous public and private schools in Jefferson County, as well as local collegiate programs. Beyond clinical and on-the-field experience, the program has the advantage of feeding off of the entire Baptist Health system. 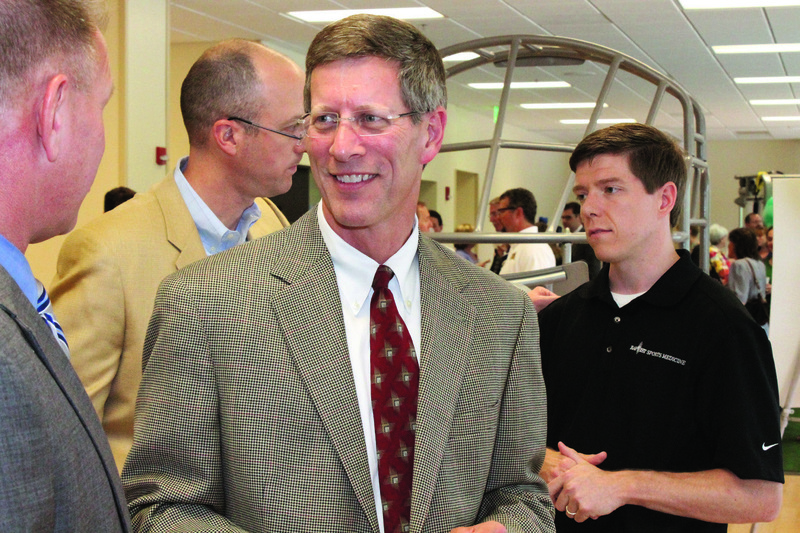 “It’s a nice avenue for the emergency room and Urgent Care centers,” says Smith. Additionally, “Baptist Medical Associates has close to 50 primary care doctors that now have a streamlined system within their own network.” Direct and easy access to myriad specialists is another benefit Baptist Sports Medicine serves up, including dentistry, OB/ GYN, neurology, neurosurgery, hand surgery, dermatology, and more. The average age of a typical orthopedic surgery patient may be closer to a retired major leaguer than a projected top draft pick, but the advantage of Baptist’s Sports Medicine program is that it is designed to treat athletes of any age at any level. “Part of our goal is also to give the weekend warrior the same access as high school and collegiate athletes,” says Wortley. With other health systems entrenched in the high school and collegiate markets in Louisville, Baptist seeks to capitalize on recreational leagues, club sports, and anyone participating in sports on any level. Baptist’s services will “take the athlete through the full continuum of care,” says Gary Costelle, director of Baptist Sports Medicine, from injury evaluation and diagnosis, to acute treatment, to surgery, to rehab, to prevention and improving performance. The new 11,000-square-foot facility includes private treatment rooms, an extensive physical therapy gym, indoor turf field, portable pitching mound, rubberized running lane, and climbing wall. It is designed as a one-stop shop for the injured athlete to increase efficiency and convenience. Physicians perform surgery at a number of nearby Baptist-affiliated surgical facilities. “Arthroscopy is the foundation of surgery in sports medicine,” says Smith. “With the use of a small camera and small instruments, small incisions are made, allowing quicker recovery, less pain, and less scarring.” While most sports medicine surgical procedures are done arthroscopically, open surgery is sometimes necessary to treat injuries that cannot be accessed with arthroscopy. Open procedures include arthroplasty of the shoulder and knee. Evidencing his expertise in open shoulder techniques, Smith performs Reverse Total Shoulder Arthroplasty (RTSA) to treat arthritis in the shoulder when there is an associated rotator cuff tear. The shoulder is a ball and socket joint that resembles a golf ball resting on tee. A standard shoulder replacement consists of replacing the bones with a metal ball and a combination plastic/metal socket, which alleviates pain but does not solve the problem of torn muscles. RTSA puts the “ball on the socket and socket on the ball,” says Smith, reversing the components and altering the shoulder’s mechanics, allowing the larger muscles that surround the shoulder joint, namely the deltoid, to elevate the arm and increase both function and strength while eliminating pain. “A vast majority of sports medicine is not operative,” says Smith, who underlines the importance of physical therapy to the program. The center will have three therapists doing sports medicine exclusively and one therapist doing sports medicine plus general physical therapy, which will continue at Baptist Eastpoint. An add-on benefit is the center’s functional rehab environment. Artificial turf, a rubber running lane, golf swing station, basketball court, and more allow patients to apply rehab to their everyday activities. Because the sports medicine field is already well-populated in the Louisville area, “to make waves, we had to take things over the top,” says Costelle. In an effort to appeal to the community and attract healthy athletes as well as injured ones, Baptist included sports performance training and conditioning in its program. Nick Sarantis, MS, ATC, CSCS, a certified athletic trainer and strength conditioning specialist and Baptist’s director of Sports Performance, says insurance only allows patients limited time in therapy. “I want to help them get back in shape after an injury, help determine what caused the injury in the first place, and build a bigger picture of looking at the whole athlete,” he says. The next logical step in an athlete’s recovery, performance training focuses on flexibility, core stability, mobility, strength, speed, and power. Training is individualized in a small group setting and offered through specialized conditioning camps. Strength training and conditioning are “the ultimate prevention,” says Sarantis. Like preseason training, prevention and education are critical to athletic success. Baptist Sports Medicine plans a series of programs covering topics such as throwing mechanics, preventing ACL injuries, and evaluating concussions. It will seek to reach not only coaches, trainers, and players, but also to educate other physicians on current treatments. Launching a program such as this one “takes expertise, talent, and reputation,” says Wortley. “Once you have the vision, you find the people. Execution, as with any service line, is the key to making these occur, as well as listening to your partners in the community,” he adds.